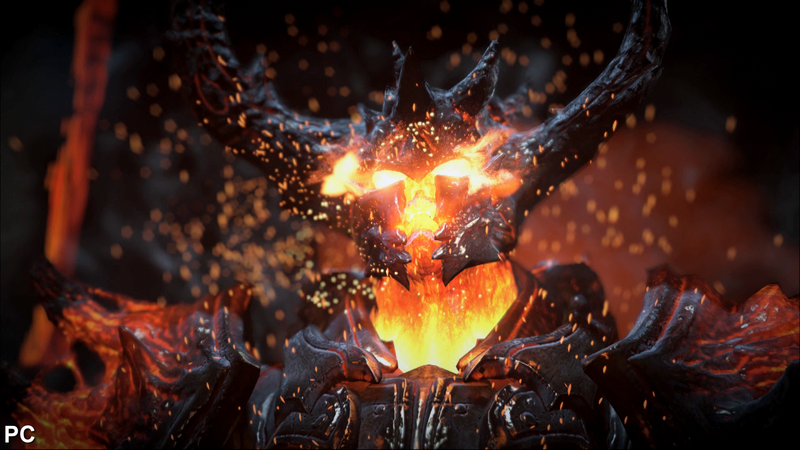 Last week's GDC reveal of Unreal Engine 4 running on PlayStation 4 hardware gave us a revised look at 2012's Elemental PC demo - at the time operating on Core i7 in combination with Nvidia's powerful GTX 680 - and after the dust settled we were curious to see how the two renditions compared directly. This should give us some idea of the ways in which Epic has reshaped its code to better suit the new console platform. Of course, it's early days and UE4 in itself is still in development, but the question remains - to what extent can PS4 match up to a top-end PC? You'd think that answering that question would be as simple as running the footage side by side and playing spot the difference, but while there's plenty we can learn by doing that, it quickly becomes obvious that Epic hasn't just "ported" over its demo - it has extensively retooled certain elements, sometimes giving the impression of increased detail, sometimes falling short. On a technological level, it's clear that the more computationally expensive effects-work in the original PC version of the demo has been pared back - not surprising bearing in mind that the raw power of the GTX 680 is a significant leap beyond that offered by the new console generation. Cutbacks aside, the overall impression from the PlayStation 4 showing is positive - in terms of detail, physics and effects, Elemental on PS4 is still a very cool piece of work, and we expect Unreal Engine 4 to pick up on the new wave of consoles exactly where UE3 left off on PS3 and Xbox 360 - as the preferred middleware of choice for next-gen AAA games development. 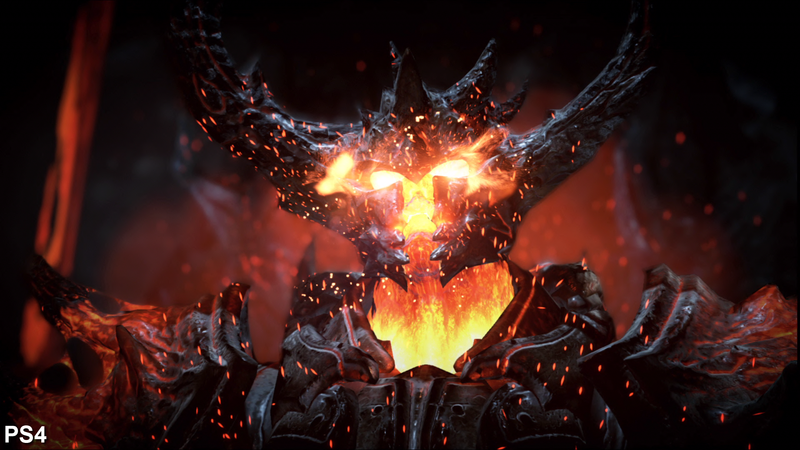 "There are many differences and compromises but the key conclusion is that the overall impact of the Elemental demo is still very impressive on the fledgling PS4 tech." 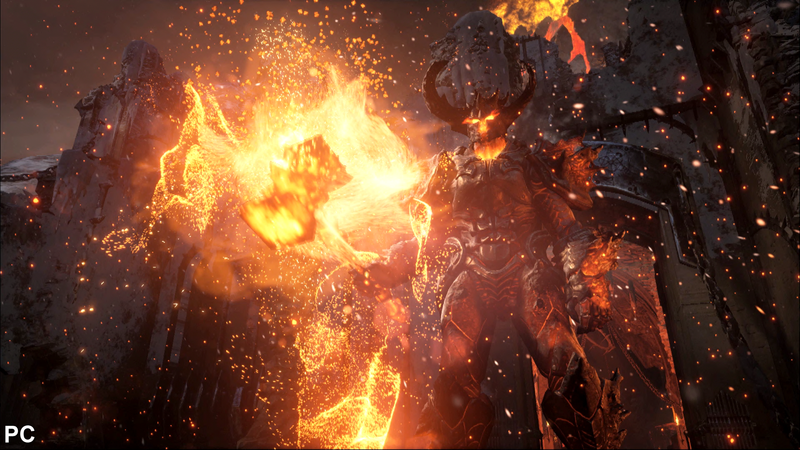 Unreal Engine 4: the Elemental Knight struts his stuff on both a high-end PC and the new PlayStation 4, with lighting and effects work the only major differences between the two. 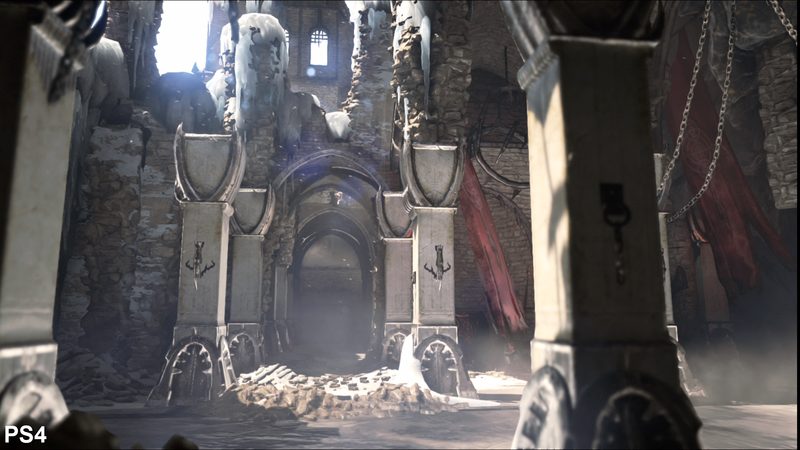 So just how has the first UE4 tech demo transitioned across from PC to PS4? The biggest casualty is the omission of real-time global illumination, which produced some really impressive lighting in the original presentation - specifically in the way that light sources "bounce" off different materials. Dynamic generation of shadows also appears to be an issue, but we can't really read too much into that as positioning of the sun appears to have changed significantly from PC to PS4, altering the way the scenes are lit. While the lack of real-time GI is a bit of a blow, we get the impression that this really heavy tech proved too much for the new console hardware (and bearing in mind the power of the PS4, an array of lower/mid-range PC graphics cards too) because it's been replaced with an enhanced solution of the "baked", pre-computed lighting system used in Unreal Engine 3: Lightmass. This works in combination with a form of real-time global illumination on objects - not exactly a new approach, as the same basic principles were in place on Halo 3. Update: To clarify, it's our understanding that there won't be a real-time GI/Lightmass divide between PC and console in final UE4 games - we're looking at the pre-computed solution across all platforms. 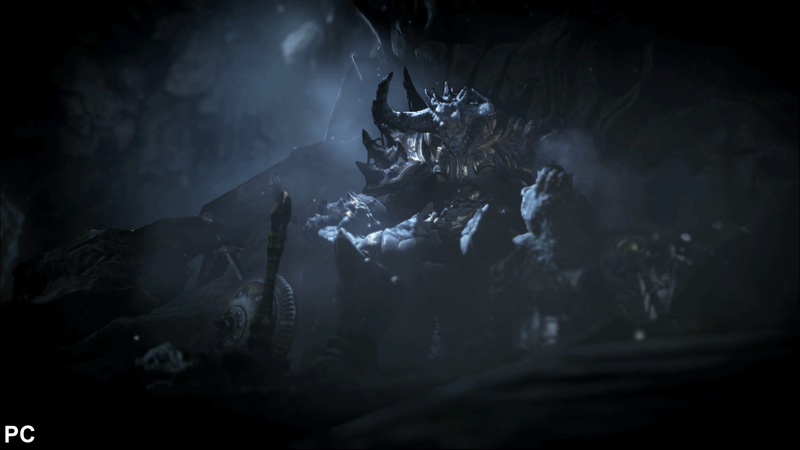 Other effects have definitely been scaled back, but not to an extent that has much of an impact on the presentation - GPU particles are fewer in number, depth of field has been significantly retooled and isn't quite as impactful on PS4, while object-based motion blur appears to have been removed. 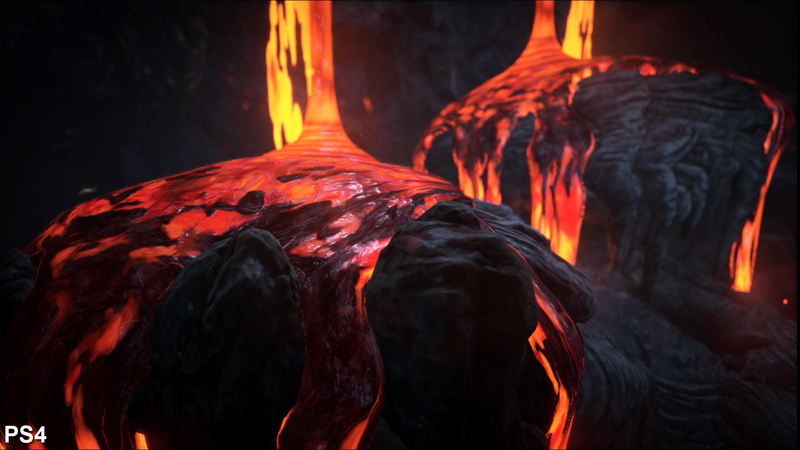 The flowing lava effect had real depth and texture to it in the original PC version - on PS4, it's significantly flatter. Lighting is fixed on PS4 and dynamic on the old PC demo with a really impressive 'bouncing' lighting effect. Shadows cast by the clouds on PC are absent while geometry appears to be pared back a touch here on PS4 for some reason, hence the lack of icicles and reduced snow. There are tweaks here to the 'atmosphere' of the scene and the depth of field along with minor geometry differences which are a bit of a mystery. It's worth pointing out that the PC asset actually appears to be 540p with interpolation (even on the UE4 logo on the outro) suggesting a video export error. Some effects are completely replaced on PS4 or removed completely. 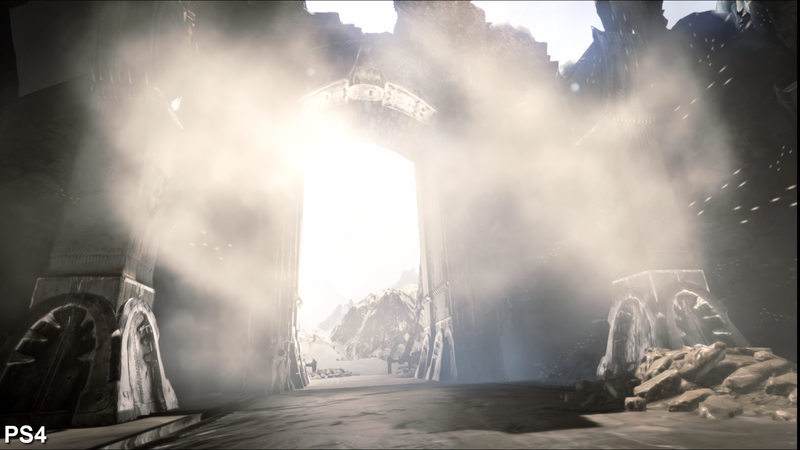 The door blasts open with a rush of snow on PC, absent on PS4. The flyby sequence that follows this scene on PC is pretty spectacular, but it's been replaced on the PS4 demo with an extended outro. 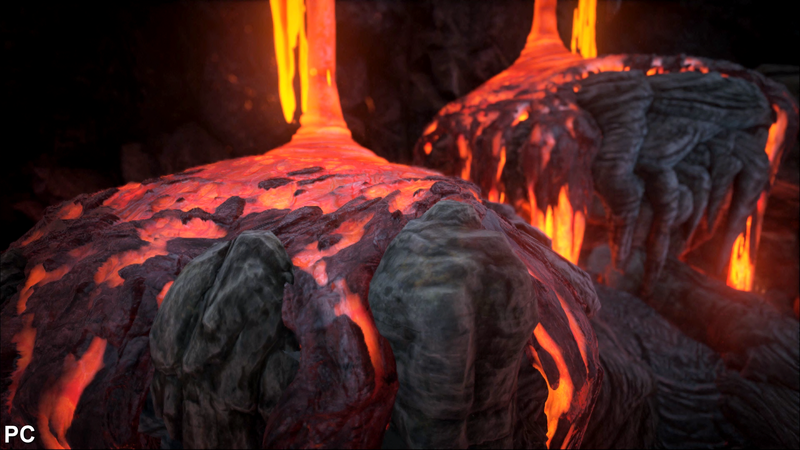 The flowing lava effect on the original PC demo has a considerable amount of additional depth and surface detail, looking a touch more flat on PS4. The lava flows through channels that really show off the light-bounce effect of the real-time GI on PC - they're gone on PS4 with the move to static GI. 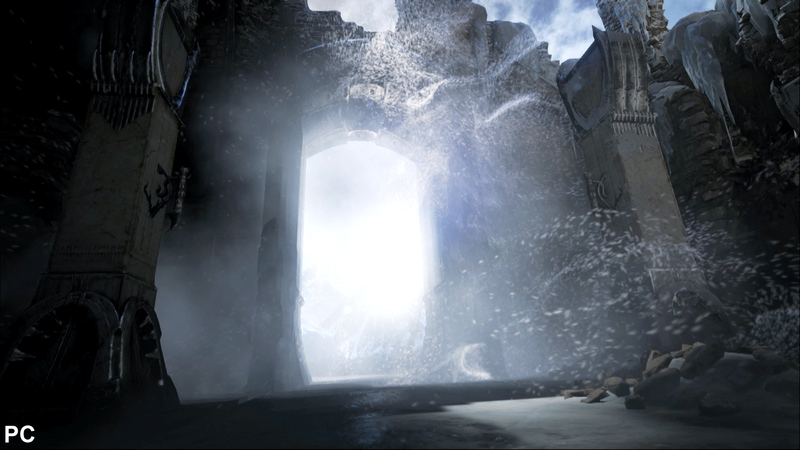 Another example of the more refined depth of field effect we witnessed in the original PC version of the Elemental demo and you can also see that the amount of GPU generated particles is considerably ramped up in the original version of the presentation. While the demo has been compromised to run on PS4, the key conclusion is that in motion, it's still a deeply impressive expression of Epic's new engine tech. The new demo features a number of artwork and asset revisions to make the scene a little more impactful and detail-rich, as seen in the walls here. One curious aspect concerns the sweeping flyby outside of the Elemental Knight's fortress - this was one of the most spectacular aspects of the original demo, but it's been excised from the PS4 version, which in turn gets an extended outro sequence we didn't see on PC, where the physics and destruction tech really gets a thorough workout, culminating in the arrival of the fiery Elemental Knight's more icy nemesis. 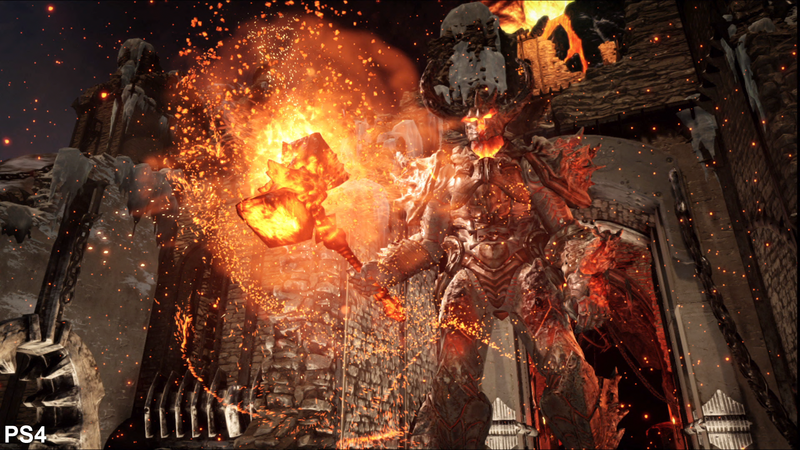 Aside from this new content, we also noticed that there's been a fair amount of retooling to assets throughout the demo - the fortress gets completely re-lit and the bare walls of the PC version are replaced with more detailed texture-work, with the reveal of this exterior backed by fiery volcanic rocks streaking through the sky. Base geometry on the fortress interior has been changed too - even down to individual rock formations being somewhat different to the original PC version. It's hard to imagine that Epic had artists redraw minimalist detail like this so we wonder whether tessellation effects (the process of dynamically generating extra geometric detail) have been tweaked for the PlayStation 4 presentation. On the one hand, seeing a year-old PC demo scaled down a tad to work on PlayStation 4 hardware probably isn't what console gamers would expect, and doesn't quite tally when other developers are talking about PS4 out-powering most PCs for years to come. But it is important to put all of this into context. 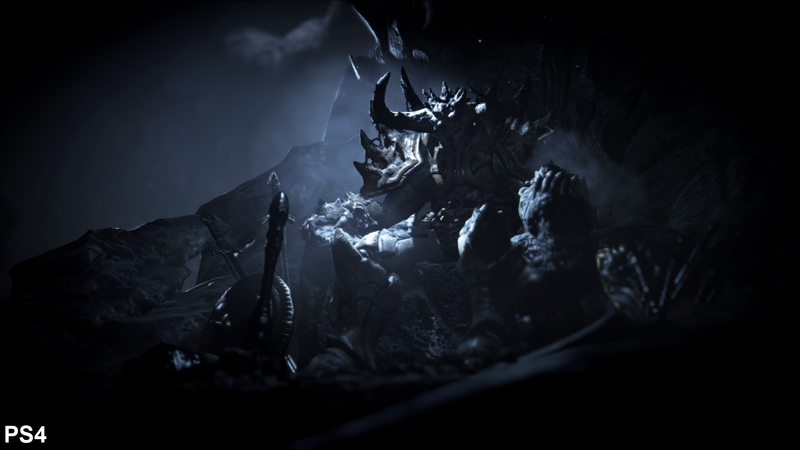 The DirectX 11 API is very mature while the PS4 tools and APIs are still in their initial stages of development - it's going to take time for devs to fully get to grips with the new hardware. Over and above that, assuming this is the same demo that was shown at the PlayStation 4 reveal, we know for a fact that most studios only received final dev kits in the weeks beforehand, the suggestion being that most of the UE4 work will have been produced on unfinished hardware. With all of this in mind, the fact that PS4 is within striking distance at all is a fairly substantial achievement. Only the omission of Sparse Voxel Octree Global Illumination tech (SVOGI) comes across as a disappointment - and from this, it's difficult to avoid the conclusion that at a base-line level, the next generation of console hardware isn't quite as powerful as Epic was hoping for this time last year. 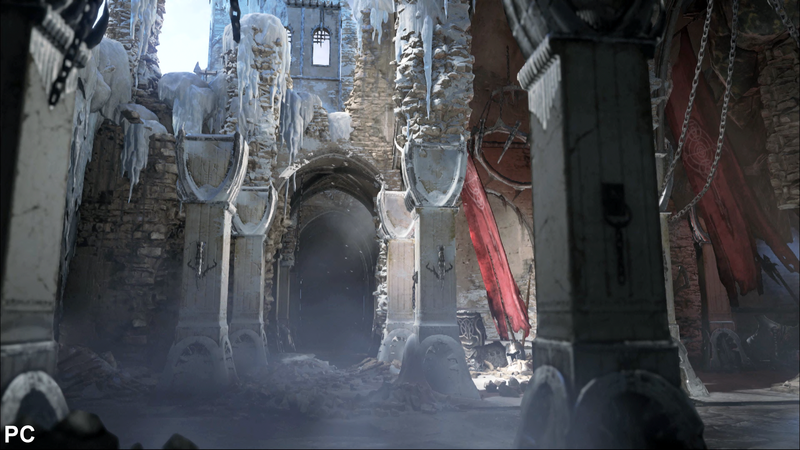 "The biggest changes actually came from the merging of two separate cinematics, the original Elemental and the extended Elemental we showed at PS4's launch event. Each had different sun directions and required some compromises to join them. This resulted in some major lighting differences that aren't platform related but were due to it being a joined cinematic. Another effect, in the original you could see the mountains through the door where in the merged one we made the view through the door white since the mountains outside were no longer the same. Same deal with the mountain fly by. The old mountain range doesn't exist in the new one. These changes from the merge make direct comparisons somewhat inaccurate. "Feature wise most everything is the same, AA resolution, meshes, textures (PS4 has tons of memory), DOF (I assure you both use the same Bokeh DOF, not sure why that one shot has different focal range), motion blur. "Biggest differences are SVOGI has been replaced with a more efficient GI solution, a slight scale down in the number of particles for some FX, and tessellation is broken on ps4 in the current build which the lava used for displacement. We will fix the tessellation in the future."